Offerings, lots and lots of offerings. I wasn’t exactly sure what I would find when I came to Bali. I booked the trip with less forethought and research than my normal trips, so there was a lot I didn’t know. Even though I’ve always been intrigued by Bali, I tried to prepare myself for the very real possibility that I would encounter a culture that, with the influx of visitors from other lands, had been heavily diluted so that what makes it so wonderful and unique are merely shadows behind a street stall that offers $3 sarongs. I was tremendously relieved to discover that while there is certainly some of this to be found, it is well balanced with plenty of Bali’s local flavor. 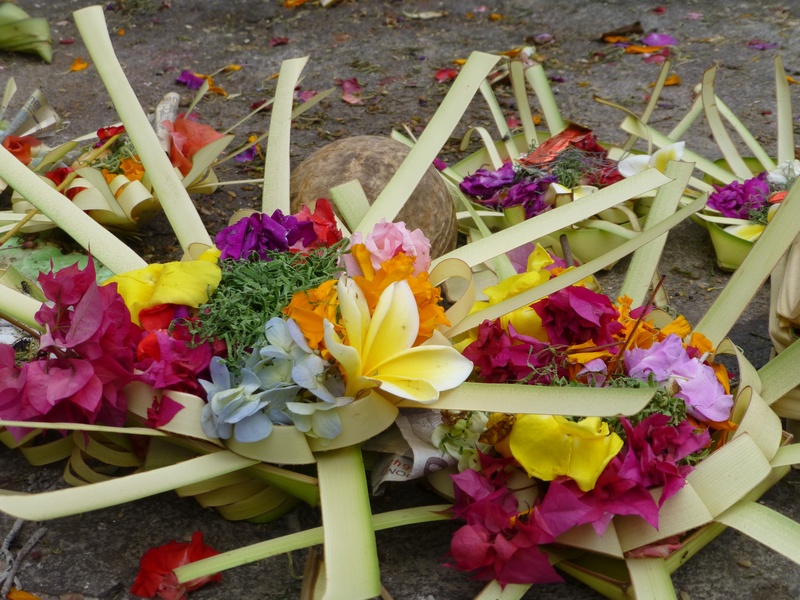 One of the most prevalent aspects of Bali’s “local flavor” is religion. When I first started thinking about visiting Indonesia, I took for granted that it’s a Muslim country—after all, Indonesia has the world’s largest population of Muslims. So I was surprised to discover that Bali is the only island in Indonesia that is almost entirely Hindu (92 percent, in fact), which was introduced into Bali directly from India between the 8th and 16th centuries. But this is no ordinary brand of Hinduism—when the new religion was introduced, it was worked into the existing indigenous beliefs (which are animist in nature—typical of indigenous beliefs), then a dash of Buddhism was thrown in through the influence of Buddhist cultures, and the result is a brand of Hinduism that is—like everything else—uniquely Balinese. They believe in the main deities of Hinduism and the concept of reincarnation, but they also worship gods that represent fertility, rice, and the four elements. A great example of the latter came from a conversation we had with a young 20-something from Sanur. 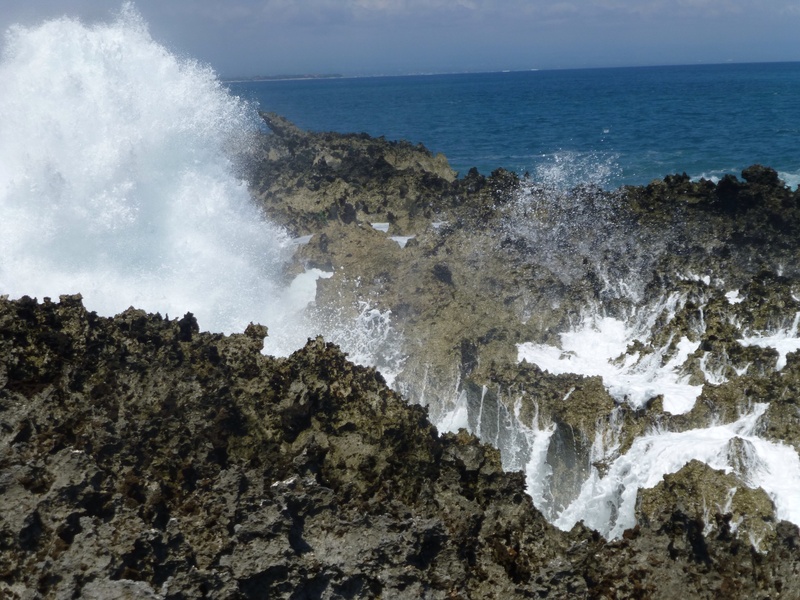 We were all standing upon one of the atolls in Nusa Dua, watching the waves crash underneath a clear blue sky, and chatting about the things that curious tourists and locals chat about when they discover they share a language. At some point in the conversation, David commented on the gorgeous weather we were experiencing in the midst of their rainy season. At that point, the young man very seriously explained that it was beautiful because there were spells cast in his town to move the rain to the other side of the island so the bad weather wouldn’t sully a local celebration—in fact, he was in Nusa Dua that day to escape the chaos of that celebration. After David inquired further, the young man explained that there are people with special gifts who were called upon for such a spell, then dances and ceremonies are held to appeal to the gods, and voila! Good weather. I jokingly asked him if they could help us Portlanders out of our long rainy season. He laughed and said he was sorry, but it was too far away (sorry folks, I tried). With all the temples, ceremonies, and offerings, it’s hard to ignore the role that religion plays in Balinese life. I believe it’s largely due to their spirituality that the Balinese have managed to not lose themselves in the onslaught of tourism and maintain the strong sense of identity that makes them so unique. For this and many other reasons, I will miss Bali greatly. However, for now, it is time again to reacquaint myself with the cold of my own native land, a land beyond the reach of a Balinese god’s power, where rain will still continue on schedule.